No more fiddling with electronics, having to remember batteries, or cleaning the impossible. BabyComfyNose™ Nasal Aspirator uses your own suction to remove nasal mucus safely and hygienically. 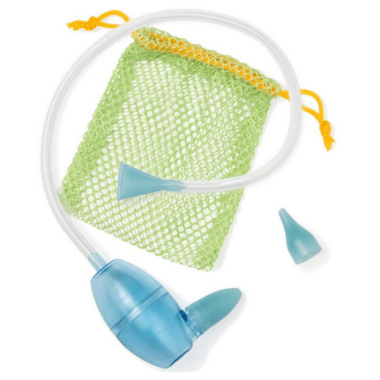 Uses lightly-wadded tissue inside the aspirator to filter mucus and germs. Can be taken apart for easy clean and storage. The mesh pouch keeps pieces together in the diaper bag and the dishwasher. Two soft nose tips included: standard and newborn.